W51 is a giant HII region / supernova remnant complex, also known as G49.2-0.7. The image shows the region in 11 cm radio emission, with the 0.5 degr. diameter supernova remnant shell (Moon & Koo 1994, see also Kassim 1992 for 330 MHz radio observations). One way to verify that supernova remnants do indeed accelerate cosmic-ray nuclei (as opposed to electrons giving rise to X-ray synchrotron radiation and Inverse-Compton gamma radiation) is to look for supernova remnants which interact with molecular clouds. Gamma rays emerging from the region where the supernova remnant shock and its accelerated particles run into targets of molecular gas provide a unique signature. A promising target region is the W51 complex (e.g. Carpenter & Sanders 1998), with the supernova remnant G49.2-0.7 and dense HII regions. Indeed, in data taken during the H,E.S.S. Galactic Plane Survey in 2007 and follow-up observations in 2008, a source of very high energy (VHE) gamma rays - HESS J1923+141 - was detected in W51, with a flux of about 3% of the flux of the Crab Nebula (Fig. 1) (Fiasson, Moriond 2009). Fig. 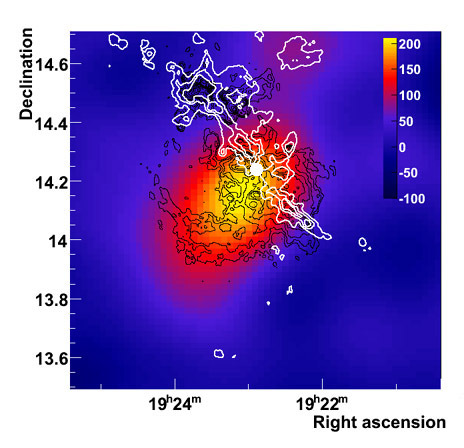 2 illustrates the location of the gamma-ray source relative to the radio supernova remnant and in relation to molecular clouds identified via their CO radio emission. Knowing whether the remnant indeed runs into the molecular clouds is non-trivial, since the distances of the remnant and of the clouds - about 7 kpc - are not sufficiently well known and one may be in the foreground or in the background relative to the other. However, in the overlap region in W51, OH maser emission has been observed (white circle in Fig. 2). 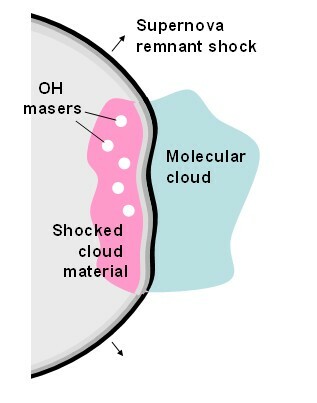 The 1720 MHz OH masers are an indicator for shock-compressed molecular clouds, the shock resulting in a level inversion and stimulated emission (Wardle & Yusef-Zadeh 2002) (Fig. 3). 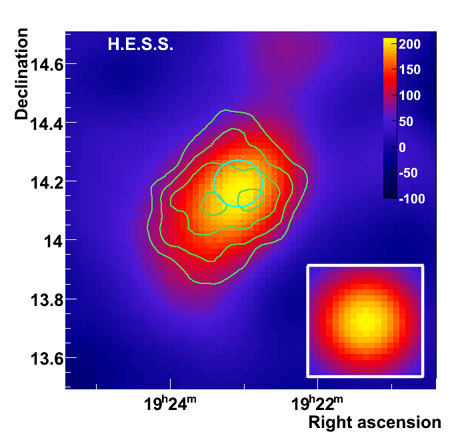 The peak of the very high energy gamma ray emission is indeed roughly in the region of the maser emission. Together with objects such as the W28 and IC 443 remnants (Albert et al. 2007, Humensky 2007), W51 adds to the growing evidence for gamma-ray emission which can be attributed to supernova remnant shocks interacting with molecular clouds. Fig. 1: Very high energy gamma ray image of the W51 region, showing gamma ray count rate. Superimposed contours illustrate the significance of detection (3 to 6 sigma). The image is smoothed; the inset at the bottom right shows the effective beam width after smoothing. The circle indicates the location of the OFGL J1923.0+1411 Fermi source of GeV gamma rays (Abdo et al. 2009). Fig. 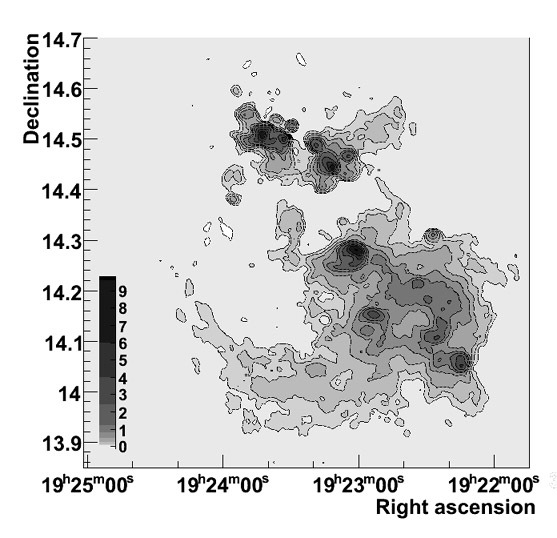 2: VHE gamma ray image, with the 11 cm radio contours superimposed in black (from Moon & Koo 1994), and 13CO radio emission contours tracing molecular clouds superimposed in white (from Jackson et al. 2006). The filled white circle shows the location of OH maser emission (Green et al. 1997). Fig. 3: Expanding supernova remnant interacting with a molecular cloud, resulting in OH maser emission from the shocked cloud material (adapted from Wardle & Yusef-Zadeh 2002).